Falling solar costs have led to an explosion of solar energy growth across the world with the USA being no exception. It has become the second largest market in the world with more than 10 GW installed. Most of this growth has come through large utility scale solar farms in the southern part of the country. However, there remains a massive potential for future growth given, that penetration of solar energy remains below 1% of the total power demand and solar costs have fallen even below that of coal and gas power in new solar auctions. While most solar plants were built through PPAs signed with power utilities, new business models are coming up which are midway between that of utility and rooftop solar energy systems. Community solar energy is taking off steeply nowadays with different financing models being seen. One popular community solar model is in which a solar developer finances and builds a small solar power plant and sells it to a geographically close knit community of residences/commercial enterprises. It can either sell equity in the project or have a pure monthly pay as you go, model. 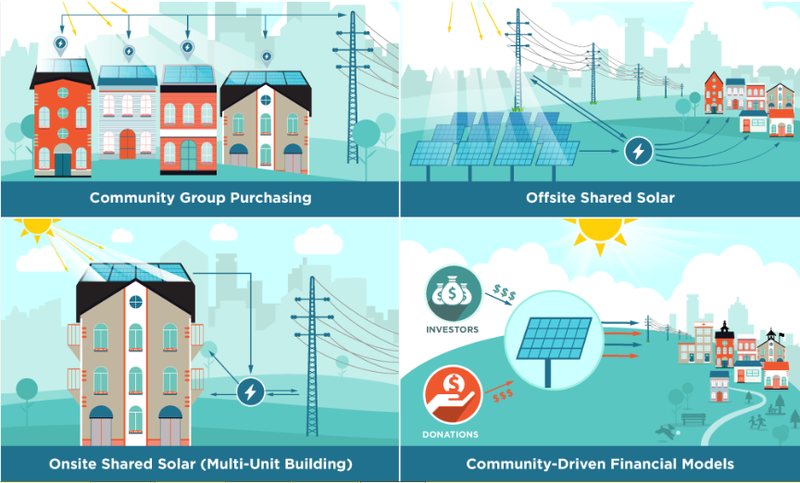 This business model was popularized by US solar installer and EPC company, SolarCity in which it used to sign PPAs with individual house owners and has now expanded into a community. Some U.S. states are trying to promote this model by introducing specific regulations and policies. New York has seen a tremendous surge of interest with more than 1 GW of community solar projects being in the pipeline. However, the execution has not picked up the pace as teething problems regarding interconnection of the projects and the cost of these interconnections still remain.